Thanos Dokos holds a PhD in international relations from the University of Cambridge. He has been a research fellow at the Peace Research Institute Frankfurt (PRIF) and the Centre for Science and International Affairs (CSIA) at Harvard University. 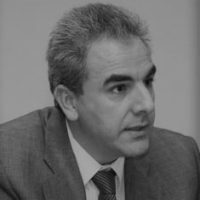 He has worked at the Hellenic Ministries of Defence and Foreign Affairs and has taught at the Universities of Athens and Piraeus. He is currently the Director of ELIAMEP, a think-tank based in Athens.